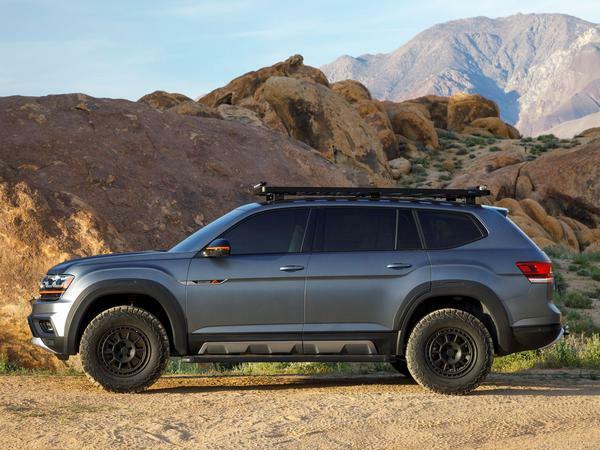 Volkswagen has revealed a more rugged take on its Atlas SUV ahead of a public debut at the New York motor show next week. 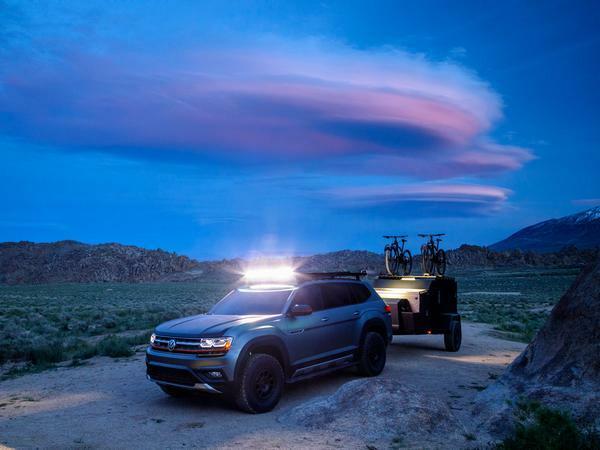 The concept has been designed for mountain bikers as a vehicle to transport them deep into the American wilderness, gaining off-road enhancements and extra hardware so it can carry all the equipment VW believes is needed to support pedal-power enthusiasts who like to get muddy. 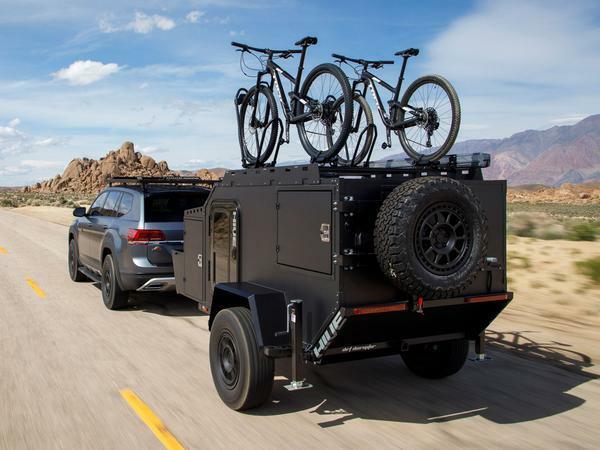 Added to the Atlas Basecamp Concept is a suspension lift kit - of course - that boosts ground clearance by a further 38mm, all-terrain tyres to deal with difficult surfaces and a roof rack to hold the bikes in place. 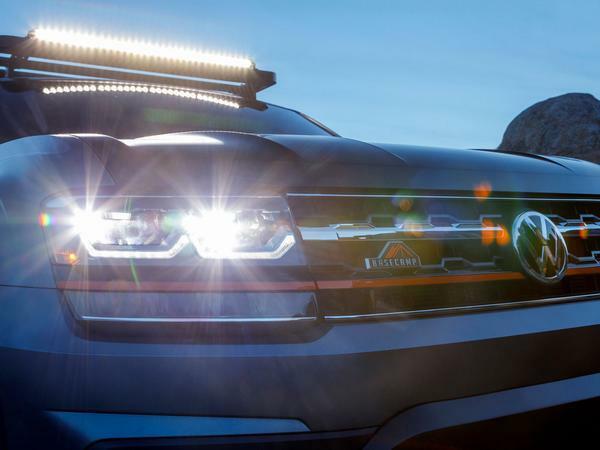 There's also an LED light bar to provide illumination away from civilisation, while a beefed-up bodykit should help to scare off any bears the Atlas may encounter. The concept wears a matte grey and black skin to complete its toughened look. Under the bonnet is VW's 3.6-litre VR6 engine, producing 280hp and powering all four wheels through an eight-speed automatic 'box. It's a setup that's shared with the regular Atlas in America; the five-metre-long SUV also comes with a 2.0-litre turbocharged petrol that produces 235hp. 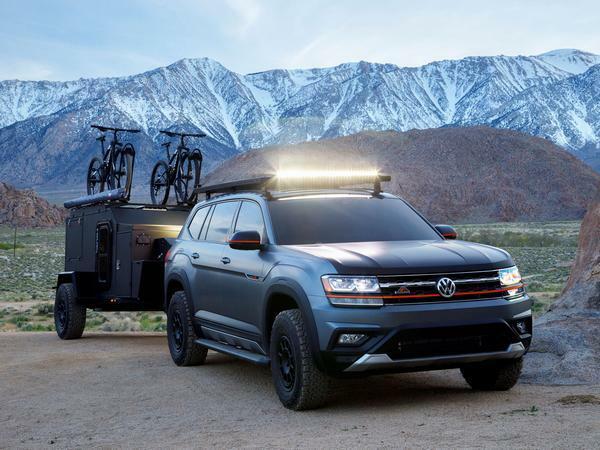 As its burly name suggests, the Atlas is a US-focussed model that won't come to Britain - which means there's practically zero chance that something resembling the Basecamp Concept will ever make it here. Boo. Well... it certainly look fit for purpose. Looks like an expensive way to go mountain biking! I'll stick to chucking my bike in the Caddy. Looks cool though. 280hp to move that massive hunk of crap? No thanks. I'd say it needs 350hp MINIMUM, and probably the same lb-ft of torque to be half useful. Pass. America just does a better job building these big utilitarian things. Bet the parts are priced like gold teeth too. In florida currently and the atlas is very common. 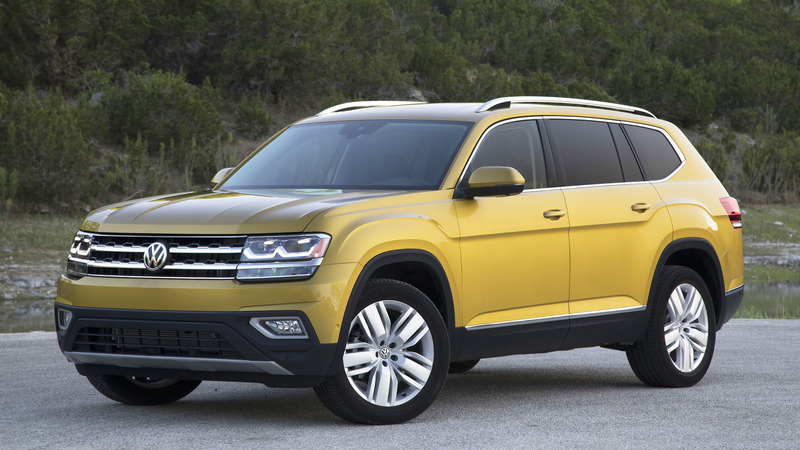 They look fairly large (audi Q9 size at a guess) so would be too large for vw brand in the UK I would guess. Any product which needs a seperate, yet equally prominent, "enhancer" product within the advert to help sell it fails instantly. That trailer looks 5x cooler then the damn truck. Though Atlas is a good name. There's a guy a few miles from me who imported one into Germany, in yellow. It's a shame it isn't offered in Europe. In the flesh it's very cool. Well they've missed the point there. Although the trailer does look kinda cool in a Mad Max way. Toyota Tundra/Tacoma appears to be the vehicle of choice for US mountain bikers. Can get 4-5 bikes in the bed without having to lift them on to the roof (modern "enduro" bikes are quite heavy) and still have seating for 4-5 riders in the cab. what is the thing it is towing ? I Didn’t know they existed until I moved to Oz. They’re really popular here and kitted out with off road suspension and a hitch with massive articulation for outback tracks.